← Explainer : What’s A Fair Price For Professional Translation? Amara (formerly Universal Subtitles) is an innovative service that enables users to create and edit subtitles and translations for web videos. Instead of hiring a captioning and subtitling agency to do this work, content producers that have active user communities, such as the TED conference, can have their users do this via a wiki-like process. Amara is similar in concept to Viki, which we have also profiled on Translation Reports, but is offered as a turnkey solution for content producers who want to display captioned videos within their website and brand. 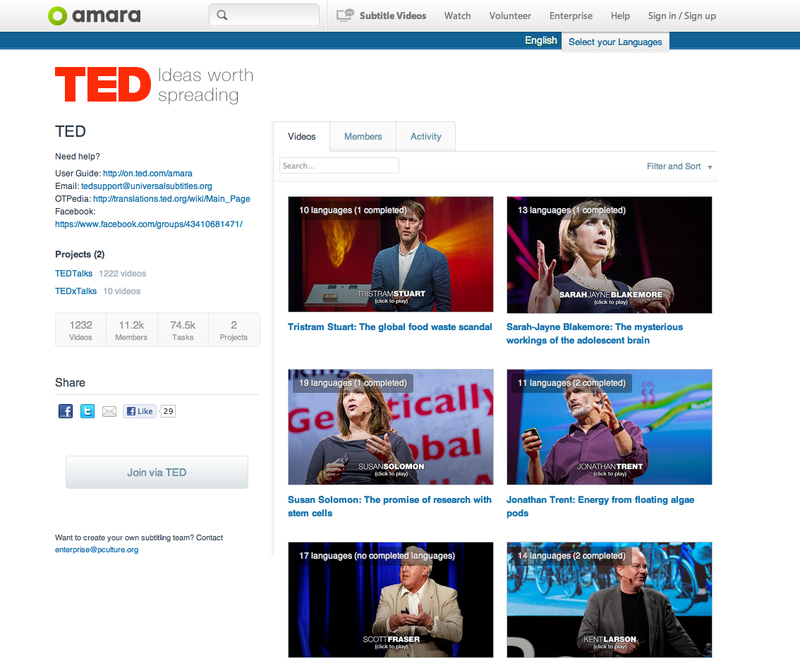 Prominent companies such as TED, Netflix, and the MacNeil Lehrer Newshour are using Amara to manage their subtitling and captioning communities. Gallery of translated videos from the prestigious TED conference. Subtitling videos, even without translation offers many benefits, such as search engine visibility (because of transcripts), accessibility for the hard of hearing, and an improved user experience, where the user can jump directly to a segment of a video that contains a search phrase. Adding translated captions will make these videos accessible to an even broader audience, just as website localization and translation can do. The process of creating and editing the captions is straightforward. First, the volunteer is prompted to play the video in short segments, and to create draft subtitles. Once the subtitles have been created, the user is prompted to sync the subtitles with the audio track, so they appear at the correct time. The user then synchronizes the captions with the audio track, so they appear at the right moment. Then, the user adds information about the captions (description, title, keywords and other meta data). The new captions are then visible to trusted users and reviewers, who can post-edit the captions or approve them for publication. 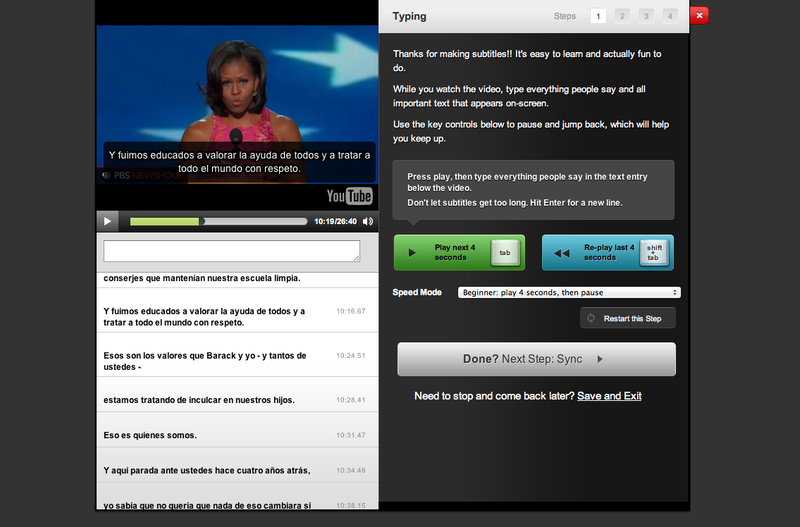 The captions themselves are displayed by a widget that overlays them onto the video player. Amara does not host video itself, but instead partners with leading web video services including YouTube, Brightcove, and Kaltura. Amara provides the content producer with the ability to control how captions are created, who can review them, as well as the publication workflow. For example, most content producers allow crowd contributions, but have trusted reviewers and translators evaluate new contributors and post-edit the captions they create. Crowd generated captions and subtitles for content that would otherwise not be economical to caption. The TED conference is an excellent example of this. Their videos are routinely captioned in dozens of languages. If they were to do this using professional translators, the cost would be prohibitive, and would for them to pass the cost onto conference attendees or viewers. Post-editing professionally translated captions. Professional captioning firms do a decent job, but they have one important limitation besides high cost, their translators are unlikely to be knowledgeable about the source material. A content producer could send a video off to a professional captioning service, or use a web translation service such as Gengo, to translate the English subtitles, and then have trusted users post-edit and clean up these texts within Amara. “Crowdsafe” translation, where users can freely contribute captions without prior approval. Their submissions are, in turn, vetted by trusted users or professional translators who assess the translation quality and the user’s reputation. Good translators can then be greenlighted to submit with less oversight, while poor translators and bad actors can be blocked. Only a handful of companies provide a turnkey solution for crowd captioning web video. dotSub and Viki are the two primary alternatives in this category. This entry was posted in captioning/subtitling, crowd translation, translation delivery networks and tagged amara, caption, captioning, subtitles, subtitling, universalsubtitles, video. Bookmark the permalink.